This story was updated at 1:00 PM EST on Wednesday, February 19. A fracking scandal is unfolding in Ohio. Environmental groups and state lawmakers slammed Republican Gov. John Kasich and state regulators this week over internal documents that they say show the Kasich administration planned to collude with the oil and gas industry to publicly promote fracking in state parks while fending off criticism from a “Nixon-style enemies list” of state lawmakers and environmental groups. In 2012, the Ohio Department of Natural Resources (ODNR) outlined a broad public relations campaign for selling Ohioans on the benefits of hydraulic fracturing, or fracking, in two state parks. The 13-page “communication plan,” which was uncovered by the Ohio Sierra Club, proposes that the ODNR enlist support from “allies” in the Kasich administration and the oil and gas industry and “marginalize the effectiveness of communications” of fracking opponents. The plan was never implemented. A list of “current and potential” non-governmental allies in the plan includes Halliburton, the Ohio Oil and Gas Association, the US Chamber of Commerce and America’s Natural Gas Alliance. A list of targeted “opposition groups” includes the Ohio Sierra Club, the Natural Resources Defense Council, EcoWatch, Waterkeeper Alliance, Ohio FrackAction and two Democratic state lawmakers. The ODNR communication plan warns that fracking in state parks would be met by “zealous resistance” from anti-fracking activists who are “skilled propagandists.” The public, the plan states, would be vulnerable to messages from fracking opponents who would paint the initiative as “a dangerous and radical state policy by Gov. Kasich.” Anti-fracking activists also may stage confrontational protests and try to physically or legally stop fracking operations on public lands, the plan states. Allies within the Kasich administration listed in the document include the Ohio EPA, Kasich’s office and the state health department. The plan also calls on JobsOhio, Kasich’s controversial economic development nonprofit, to promote fracking in state parks as an opportunity for creating jobs. The ODNR did not respond to Truthout’s request for a statement on the PR strategy document. A spokesman for Kasich also did not respond to a request for comment. On Tuesday, Rep. Nickie Antonio and Rep. Robert Hagan, the two state lawmakers listed as opponents among the environmental watchdogs and activist groups, sent a letter to the speaker of the Ohio House demanding legislative hearings to determine whether Kasich and the ODNR improperly promoted the interests of the oil and gas industry instead of protecting the public. Rob Nichols, a spokesman for Kasich, initially told the Columbus Dispatch on Friday that the governor’s office had never seen the communication plan. 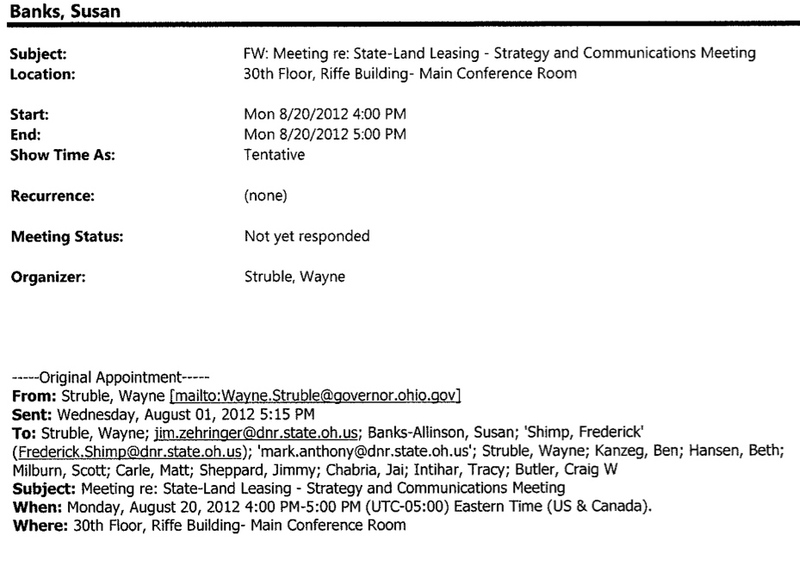 Internal emails released this week by the Ohio Sierra Club and ProgressOhio, however, show that Kasich’s senior staffers were invited to a meet with top ODNR officials to discuss a “strategy and communications” for leasing state lands for oil and gas development. The meeting was called for August 20, 2012, the same day the communication plan strategy is dated. Nichols did not respond to two requests for comment from Truthout, but he did release a statement to reporters in Ohio after ProgressOhio accused the governor’s office of a cover-up. In 2011, Ohio lawmakers approved fracking and drilling in state parks. Kasich signed the legislation but has not filled seats on a committee that would oversee oil and gas extraction on public lands, so fracking has not occurred in the state’s parks. After Hagan and Antonio demanded an investigation, Nichols told the Dispatch that Kasich does not support fracking in state parks and has not for the past year and a half, although his office reserves the right to revisit the issue.